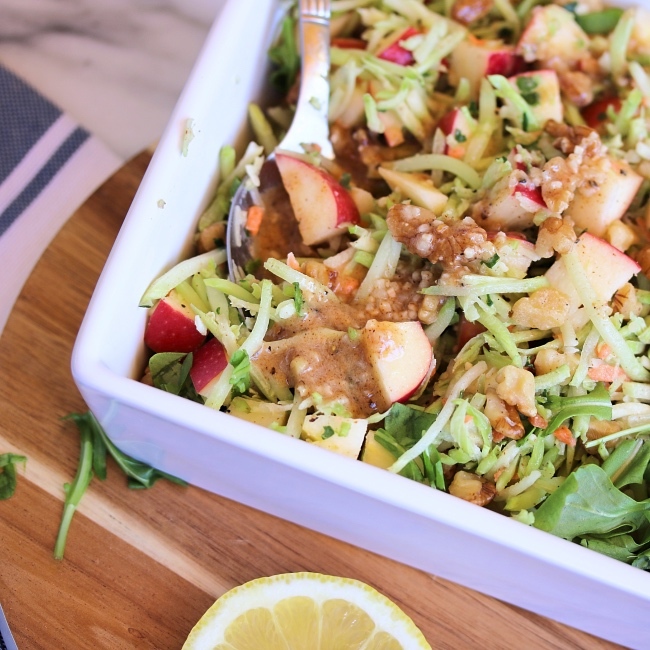 We love the balance of fresh, crisp fruits and veggies with the creamy, tangy dressing. Recipe has been updated with the option of sliced almonds OR chopped walnuts as a mix-in: we love them both! I have loved getting creative with my food concoctions lately, and it makes it SO much more fun having an in-home taste tester who also loves & appreciates healthy food. Dathan is the one who introduced me to Paleo, and is definitely a "good eater"... in both senses of the word: he eats healthy, and he eats a lot! It's been fun to coming up with new recipes for us that are budget-friendly, tasty, and healthy! 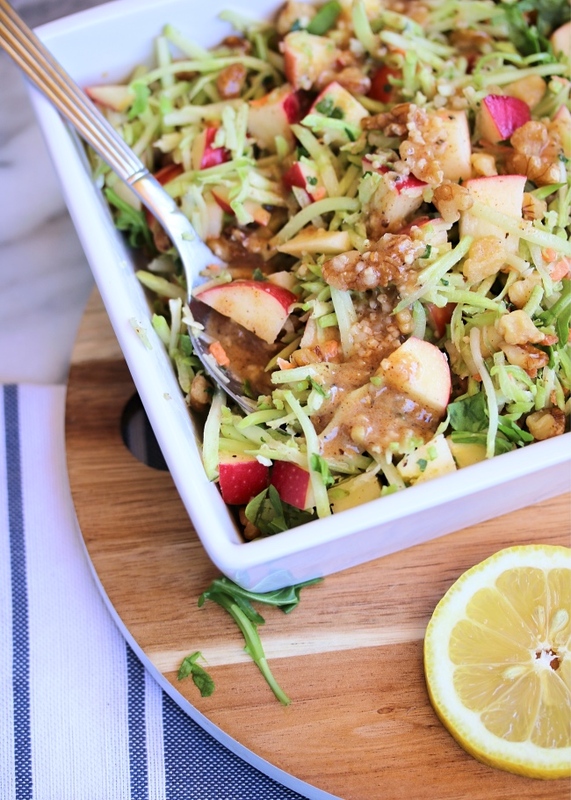 This is one of my recent creations: broccoli apple slaw. I start off with a simple bag of broccoli slaw mix~ you can find it at Trader Joe's, or check out the selection at your local grocery store. I then toss in a few ingredients, whisk up the quickest dressing of life, and the perfect summer side dish is done. We love this with grass-fed hot dogs, salmon burgers, and stuffed turkey burgers. This would also be the perfect light dish to bring to a barbecue or summer gathering... super light & fresh, and a great way to introduce your friends & family to Paleo! Show them that healthy eating can taste amazing too! The recipe below is for those, like me, who prefer a light coating of dressing. If you like a heavier amount, just double the recipe for the dressing! You can always save any extra for your salads. 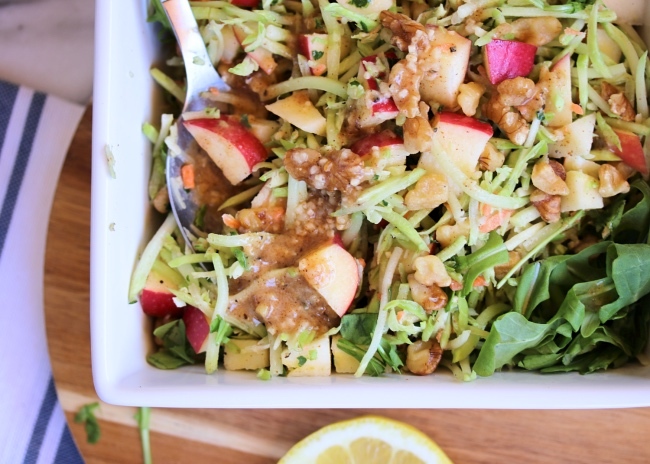 Combine the broccoli slaw, diced apple, and sliced almonds in a medium to large bowl. 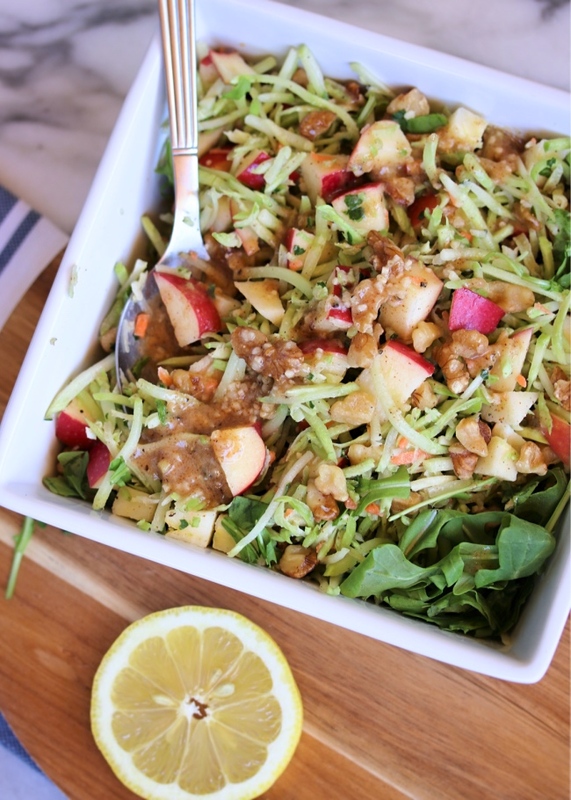 In a small bowl, whisk the remaining ingredients (almond butter, ACV, lemon juice, garlic, & avocado oil) until fully combined- this is your dressing. 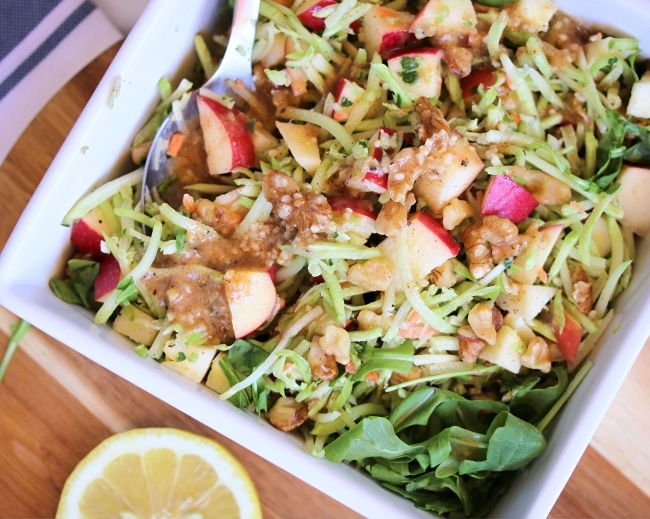 Drizzle the dressing over your slaw, and toss until evenly coated. Season to taste with salt & pepper, and enjoy! Awesome, so glad you liked it Michelle! It's quickly become one of my favorites too :) Enjoy your camping trip! !